Saint Vincent de Paul, Priest - My Catholic Life! Today’s saint was one of the brightest stars in the galaxy of saintly men and women who rejuvenated Catholicism in seventeenth century France. Saint Vincent de Paul established charitable societies that have endured to this day. He also founded male and female religious orders that still thrive in the twenty-first century. He was a trusted counselor to bishops, cardinals, and royalty. His ideas and vision reformed how seminarians and priests were trained so fundamentally that this vision became normative for the world-wide Church. He was a close friend of Saint Francis de Sales, his own co-founder Louise de Marillac, and the almost-saint Pierre Bérulle. Saint Vincent had a great influence on Jean Jacques Olier, the founder of the Sulpician order and a prime mover behind the group of French Catholics who risked everything to found Ville-Marie de Montreal, the explicitly Catholic settlement at the farthest edge of French Canada. Our saint also inspired Blessed Frédéric Ozanam, the lay intellectual who established the Saint Vincent de Paul Societies so commonly found in parishes throughout the world. 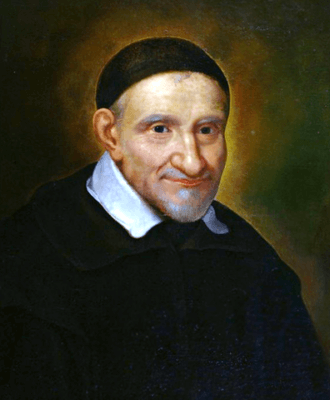 Few saints achieved so much as Vincent de Paul. He stood at the core of an evolving group of similarly minded French saints who left an impact like a meteor on the face of the Church. So although he cannot be understood apart from the charitable Society that bears his name, nor can his achievements be confined to that eponymous Society alone. Saint Vincent tried to use his education and personal charm to correct the errors of Jansenism, an overly rigorous spiritual and moral approach to the Christian life that infected wide swaths of the French faithful. When his personal efforts were unproductive, he became more polemical and was instrumental in procuring a papal denunciation of Jansenism. Our Saint’s contributions to the renewal of the life of the clergy were notable. He was a proponent and founder, along with Bérulle, of the so-called French school of spirituality, which has been so universally adopted in priestly formation that there is, in reality, no other approach. This spirituality combines rigorous asceticism, practical and active concern for the poor, a missionary drive to the unconverted, a sophisticated theological education, simple and direct preaching, and a total reliance on the Virgin Mary and the Holy Trinity in seeking to do the will of God. These high ideals, this total approach, inspired Vincent’s near contemporaries Saints John Eudes, Louis de Montfort, and Jean-Baptiste de La Salle to become who they were. To be a man of action and contemplation. To be educated but also able to communicate with the simple. To focus on the salvation of souls but also on the material concerns of the needy. To be fully a priest but to have wide circles of lay friends and followers. This was the vision of Saint Vincent de Paul for all priests, and the vision he himself put into action in his own life. He was a force of nature who stormed through life for the glory of Christ alone. Devotion to Saint Vincent followed soon after his death. He was canonized in 1737. His remains are displayed for veneration in a glass coffin above the altar in the ornate chapel of the Vincentian Fathers in central Paris, not far from the chapel of the Miraculous Medal. A partially concealed staircase allows access for the faithful to see the great man up close. Saint Vincent de Paul, you worked tirelessly for the poor, orphans, and widows. You gathered around yourself numerous helpers. Your primary motivation was not social justice, but the pure will of God. Inspire us to be so committed, so dedicated, and so faithful. ST. VINCENT was born in 1576. In after-years, when adviser of the queen and oracle of the Church in France, he loved to recount how, in his youth, he had guarded his father’s pigs. Soon after his ordination he was captured by corsairs, and carried into Barbary. He converted his renegade master, and escaped with him to France. Appointed chaplain-general of the galleys of France, his tender charity brought hope into those prisons where hitherto despair had reigned. A mother mourned her imprisoned son. Vincent put on his chains and took his place at the oar, and gave him to his mother. His charity embraced the poor, young and old, provinces desolated by civil war, Christians enslaved by the infidel. The poor man, ignorant and degraded, was to him the image of Him Who became as “a leper and no man.” “Turn the medal,” he said, “and you then will see Jesus Christ.” He went through the streets of Paris at night, seeking the children who were left there to die. Once robbers rushed upon him, thinking he carried a treasure, but when he opened his cloak, they recognized him and his burden, and fell at his feet. Not only was St. Vincent the saviour of the poor, but also of the rich, for he taught them to do works of mercy. When the work for the foundlings was in danger of failing from want of funds, he assembled the ladies of the Association of Charity. He bade his most fervent daughters be present to give the spur to the others. Then he said, “Compassion and charity have made you adopt these little creatures as your children. You have been their mothers according to grace, when their own mothers abandoned them. Cease to be their mothers, that you may become their judges; their life and death are in your hands. I shall now take your votes: it is time to pronounce sentence” The tears of the assembly were his only answer, and the work was continued. The Society of St. Vincent, the Priests of the Mission, and 25,000 Sisters of Charity still comfort the afflicted with the charity of St. Vincent of Paul. He died in 1660.